Wherever you are, whatever you celebrate may it be joyous, safe and warm. Here's to a happier and healthier 2014 for everyone. 2014 Will Be Here Before You Know It! ©2012 Theresa Buchle. All rights reserved. So, I'm getting ready for big changes. I've got a new calendar/organizer to keep me on track - Lisa Jacob's business planner. I've got specific web pages bookmarked to read and absorb information like a sponge. I'm part of different groups on Facebook and Google+ to help me out. And I've got pages bookmarked for inspiration. You also know I'm all about the giveaway. Today's giveaway is not jewelry, nor is it supplies - it's information. If you've never checked out Flourish & Thrive Academy now is the time. Tracy and Robin are hosting a 10 day challenge to get you prepared for success in 2014 AND there are prizes. Be sure you enroll before the 19th of this month. What are you waiting for? Go check it out! I hope you and yours had a wonderful Thanksgiving (if that's what you celebrate!). What did I do in November? I wrote a book! 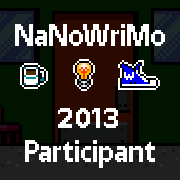 At the very last minute I signed up for the National Novel Writing Month challenge - 50,000 words in 30 days. It's rough, it needs to be fleshed out, the characters are not done with me yet, but I took it from beginning to end in one month! And I reached my goal of 50,000 words early because . . . .
We went camping for Thanksgiving! 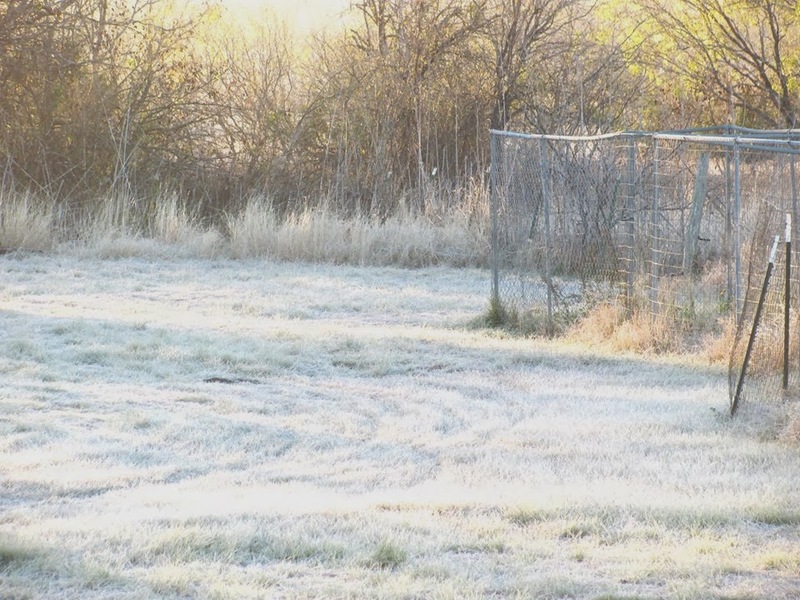 Four cold days in Stephen F. Austin State Park. It had recently flooded, so there was water everywhere. Some of the campsites had standing water in them - not puddles, standing water. Our own site had been under water at the beginning of the week! We were surrounded by green everywhere and by trees. I saw my very first Mississippi Kite - a beautiful bird. Think of a small, silver colored hawk. We heard cuckoos at nightfall, owls right outside our tent, and one night the beautiful sound of coyotes greeting each other. Ariel saw a giant armadillo (her words) and we came across fellow campers on a trail carrying a huge rattlesnake that the young man had just killed. We had our own rattlesnake encounter when we got back home - Ariel was startled by one in the back forty when putting up the bikes. I thank the universe that she was not bitten! It was too close a call - her dad came to her rescue and took care of the snake. I hate killing them but sometimes it's a necessity - this one was too close to the house (we only have an acre, mind you) and too close to the child and the animals. Mama Cat has been bitten and is recovering nicely on her own, but I don't want anyone/thing else bitten. It was cold and muddy - this is where I spent most of my time. We had our traditional mac and cheese with sausage - not good for me, but it's tradition. And cheesecake (our Thanksgiving pie), s'mores, broccoli cheese soup - several times (there was a lot of it). And of course, hot cocoa! Now it's time for Christmas/Yule celebrations, a very special birthday later this week, a visit from my darling boys and then Christmas with them. If I'm lucky, a big Yule fire in the back forty with friends. 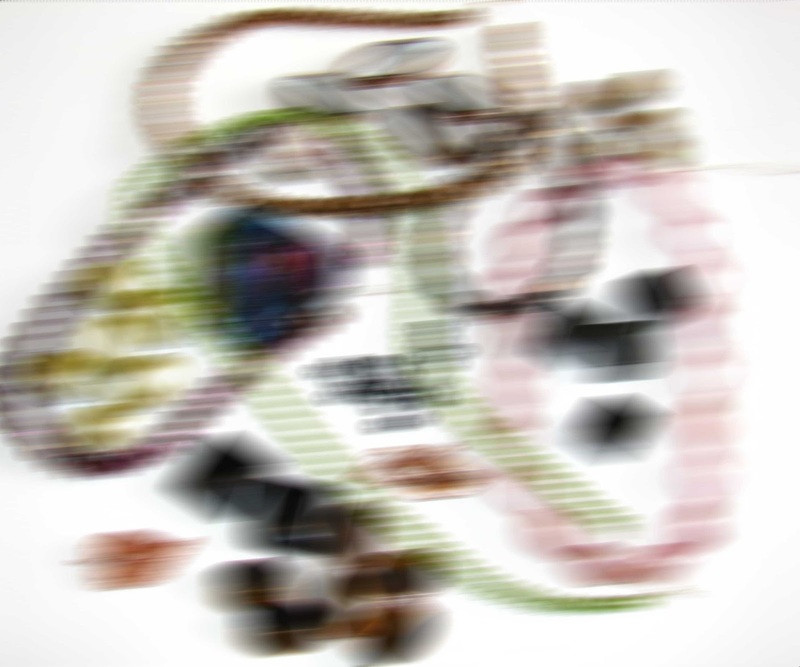 I will also start planning my strategy for 2014, because those beads are calling loud and clear - my brain is filled with a cacophony between the beads and the book characters. I'm staging a comeback and a premier at the same time - bwahahahahahaha! Looks like December will be a crazy month too! Talia of Swirly Shirley included my Coral Reef bracelet in the fantastic treasury. Thank you, Talia! And a tiny beady break. 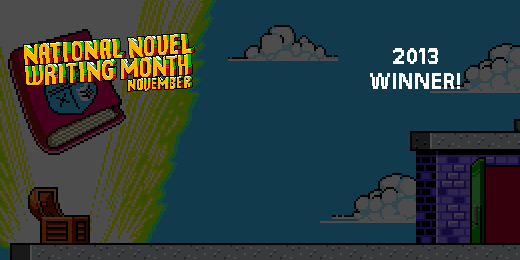 The month of November is National Novel Writing Month. So I'm working on a novel - it's one that's been inside my head for a while. The challenge/goal is to write 50,000 words by the end of the month. There are lots of tools, fellow writers, and many, many pep talks. There are also face-to-face gatherings which can be good for a wanna-be hermit like myself. So, as of this moment, I am on schedule with my daily word count and we will see what happens. If I can just get the bare bones down, I will feel like I've accomplished a lot. In the meantime, I'm keeping my bead angel very busy. 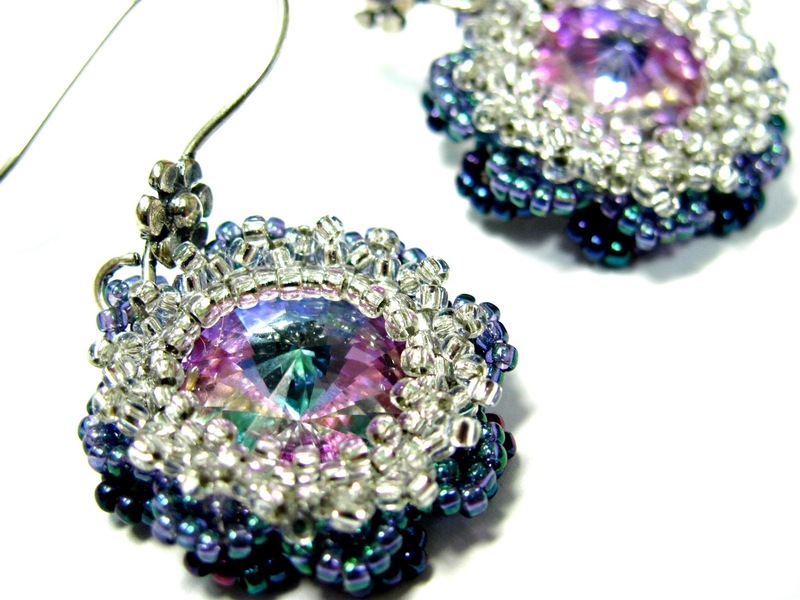 She has four projects and she is busily beading samples. All of those will be downloadable tutorials. She beads samples, I write tutorials. I learned several years ago that I cannot do it all and having a dear friend like her is indeed priceless. She is an angel, a cheerleader, a shoulder, a confidant, and a soul mate all wrapped up in one wonderful package. 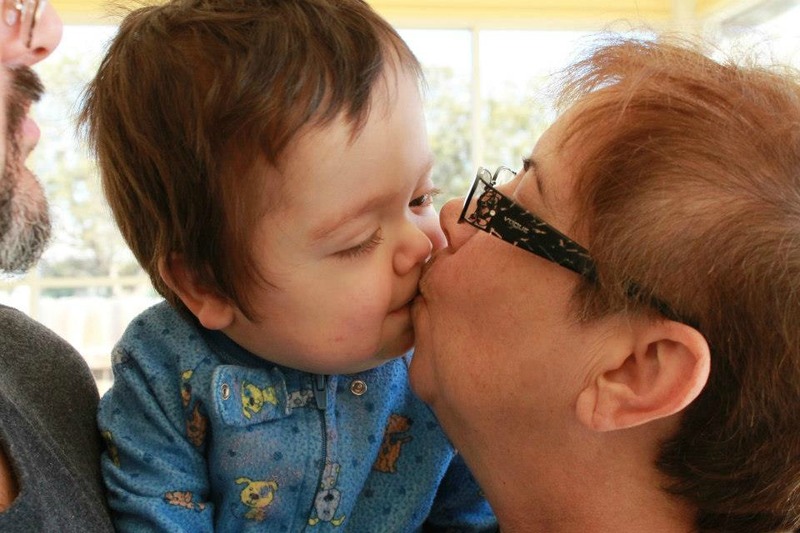 Love you, Gaye! And he is due in the spring! Grandson Number 4 is eagerly awaited by everyone! It's November and it seems that it's time for Thanksgiving - I am always very thankful for my family. I am also thankful for friendships, old and new. I only wish I had been taught at a much earlier age how to stay in touch with people. So, oddly enough, I am very thankful for social media! I have reconnected with folks that I've know since I was in 8th grade. That being said, I am thankful for this every day and not just during the month of November. I am seeing a "30 days of Thanksgiving" going around Facebook. So what are you thankful for right now? Torn Papertm was kind enough to include my Coral Reef bracelet in this fabulous treasury. I always, always appreciate the treasuries. Do you fret because you can't buy those lovelies you see at your local craft fair or art show or simply on Etsy? These will be in my shop soon. The earrings to the right are a favorite pair with a lime green (bad photo) magnesite ball, a Vintaj brass drop and Vintaj brass ear wires. I am loathe to part with them. They have a matching bracelet. Yes, in the Etsy store soon. I consider myself lucky as I can wear just about any metal with no problem. HOWEVER, I realize that a lot of my customers simply cannot wear anything other than sterling silver. Some cannot even wear sterling. I have found a temporary solution for you at One Good Thing by Jillee, which is a great blog full of homemade goodness from cooking to cleaning. Here's the link to a simple remedy to keep your sensitive ears sensitive but still wear those cute earrings you've been eyeing. No you have no excuse - go forth and shop! Cindy Wimmer is not only doing a blog tour for her new book, she's giving away STUFF! Yes, that's right - STUFF. Visit her blog for more details on this generous give away opportunity. Even someone like me who focuses on tiny little beads woven with needle and thread needs fabulous wire work to show them off once in a while. Besides, it never hurts to add to your repertoire. Bead on, beadlings! I found this photo in multitudinous places all over the Internet. Try as I might I could not find a source to credit it to. As I read on one of those places, trying to locate the source was in itself a little overwhelming. Yes, I'm feeling a bit overwhelmed. I think I have put too much pressure on myself, which is not unusual for me to do. I'm also a little disorganized right now. A photo of my studio would be just downright embarrassing. I have lots of ideas spinning around in my head. 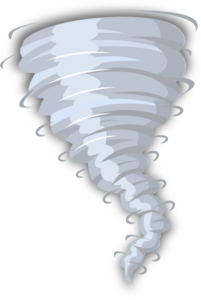 Sometimes grasping just one seems, well, overwhelming - kind of like pulling one thing out of a tornado. Overwhelming to say the least. When I was studying nutrition a couple of years ago I took a stress management as one of my elective courses. One thing we were taught is that, contrary to popular belief, multi-tasking is stress inducing and can lead to a feeling of being overwhelmed. I a good article on Psych Central that had some useful words of wisdom. 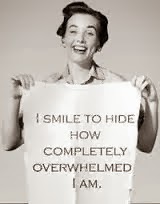 So my question for you today is: How do you overcome feeling overwhelmed, whether in beading, jewelry making, art, or just day-to-day existence? Remember, inquiring minds want to know. I was looking at my Linked In page and noticed that I had visitors - an anonymous attorney at the US Attorney's office, another anonymous person, evidently an administrator at Cornell University, someone in semiconductors in San Francisco, and a couple of others who wants to remain anonymous. Well, how about that? No, I don't give that link out. It doesn't really do much for me. But it does make me wonder. Then I was searching for something of interest for YOU and took a look at my blog links. I noticed that some of my fellow bloggers have not updated in a year (or more!). Oh my goodness! Well, that's not good, is it? So I guess I'll clean those up a bit for you. Have a beady blog I should add? Let me know - I'd be happy to link to it. I considered photographing today. I'm not sure I'll find another model like the one above and my back is protesting a bit from all the bending, twisting and positioning. We'll see. I might just work with the photos I took yesterday. I do have a tutorial to write. But I'm working at home - yay! Maybe I'll publish. Oh wait! Yep, stories and novels. You'll have to search for the noms des plumes though! So, what's new? Me? Well, I've actually reverted to old tricks - sort of. The T-man has a brand new gig and I am now helping him in a temporary capacity as his Girl Friday, but I am also back in my little studio space doing my own thing. Half a day here, half a day there - most of the time it works that way. Right now it's the best of both worlds. And unfortunately to do that Girl Friday gig I had to give up the teaching spot at Nomadic Notions but they will always hold a dear spot in my heart. It doesn't mean I won't be teaching, it just means I'm on hiatus while I take care of clearing off my work table in my studio. It seems to be cluttered with beads and such. So for now, I'll be loading the Etsy shop with tutorials like the one you see above. 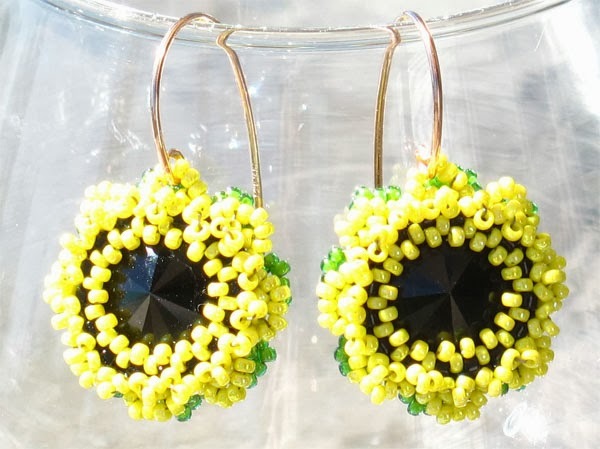 That's the Sunflower Earrings Tutorial and that gorgeous sample was beaded by my bead angel Gaye. She does a wonderful job of beading samples for me. Give her a big round of beady applause! So, it's nice to see you again. I'll be back in a couple of days with more beady goodness. Keep on beading on! I'm going to put things under construction for just a little bit but I'll be back, full tilt, before you know it. 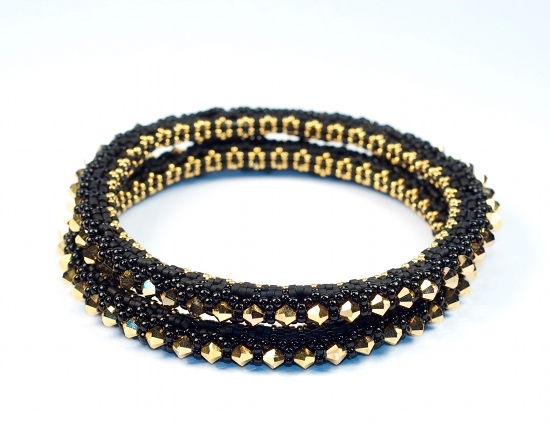 In the meantime, keep on beading on! The Etsy store now has instant downloads! AND you can now use credit cards and/or Etsy gift cards! AND I am working on adding some new tutorials and some revamped old favorites! What's that? What's going on? Well, I'm off my feet for a couple of weeks so I am making the best of it. Stay tuned! 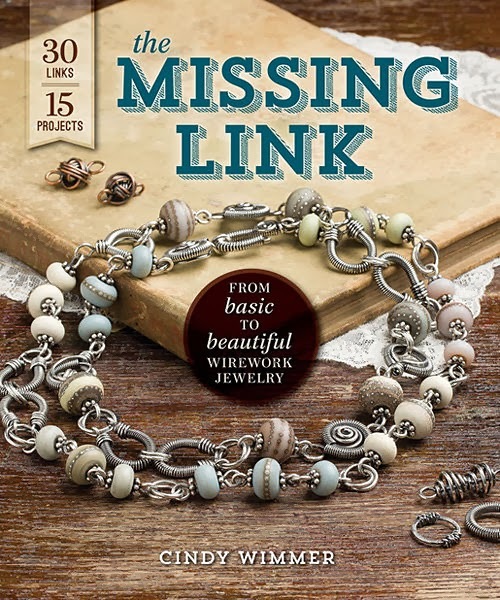 Bead Soup Blog Party Reveal Time! T: How long have you been working for B&B and how did you get to where you are today? J: I've been working for B&B since 2005 and for Kalmbach Publishing since 2002. I started at the company as a part-time administrative assistant in the Books Department and worked my way up to my current position. It's been quite the journey! T: Did you bead before the job or did it become part of your life after you signed on with the magazine? 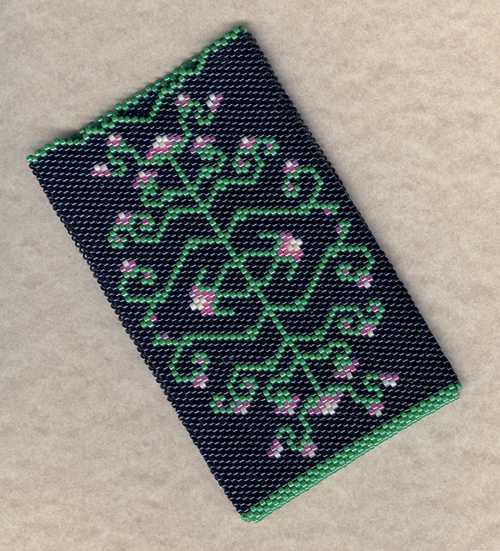 J: When I started in Books, I had no beading experience but I did have access to all the back issues of Bead&Button, so I would take them home in the evenings and on weekends and I learned the various stitches and techniques that way. I worked on some of the early books and booklets in the category so I learned a lot just by reading through those. By the time I was hired as an associate editor for the magazine, I had a lot of basic techniques under my belt, but I really got immersed in the hobby at that point. T: I've visited Milwaukee once for the B&B show, but what is it like living and working in that area? Remember, I'm Texas born and bred so the thought of living where it snows that much is alien to me. The year I was there I had to buy a sweater in June because it was so cold there! J: Milwaukee is a great place in a lot of ways – there are great restaurants, parks, and performing arts organizations. We have an amazing art museum and there are things to do here year-round, as long as you can deal with the weather. For instance, we know that just because March 20 is the first day of spring this year, we may not get really nice weather until early- to mid-June, when it will be perfect for one day and the following day it will be blazing hot and three days later we'll need to pull out our jackets again! But like I said, we get used to it. One of my favorite weather conditions is actually when it is about 20 degrees and sunny with no wind. If I'm dressed properly, it's just awesome! 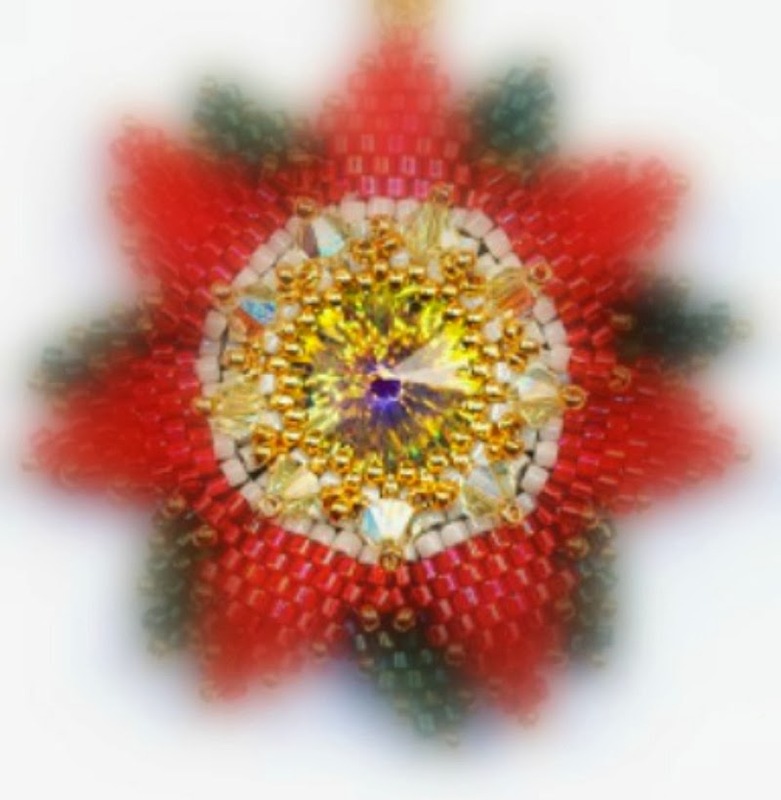 T: What is your favorite beading technique? Is there a reason why you prefer it over others? 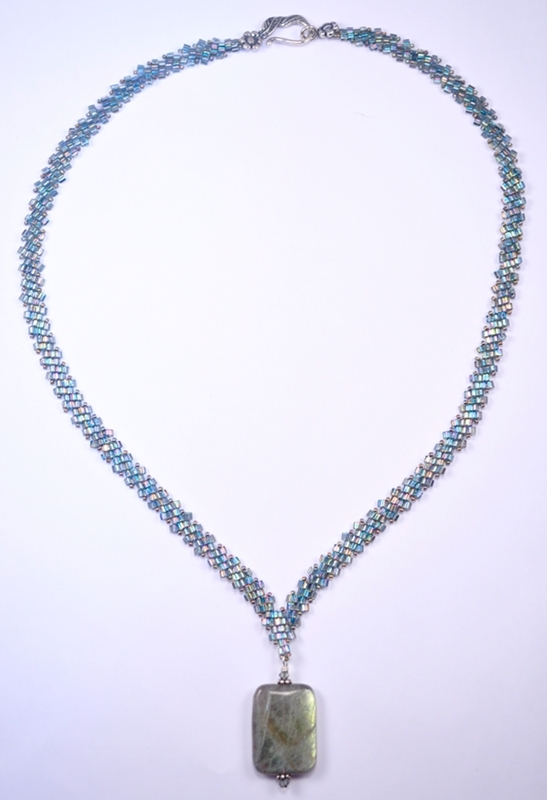 J: I don't know if I have a favorite beading technique – I really enjoy all of it. 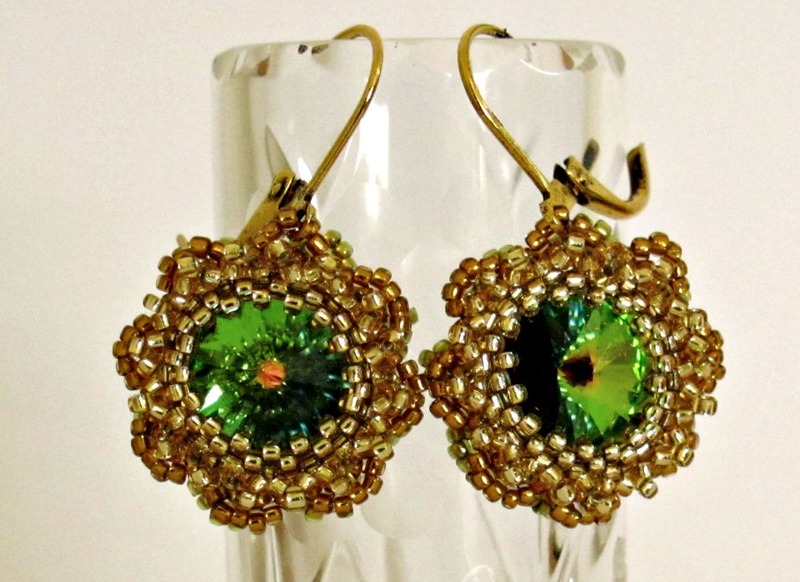 I stitch, string, and crochet, do wirework, kumihimo, and loomwork, and I even do a little with polymer and metal clay. Maybe it's because I am always trying new things and I haven't really dug in and gotten obsessed with a single technique, but I can't seem to claim a favorite. T: Working for a major beading magazine, what do you do for relaxation? (I get this question a lot & my answer is usually fishing) Since my coworkers and I work with beads all day, most of our customers think beadwork is what we do to relax. It's difficult to explain sometimes that beads are work; beadwork is still work & not necessarily what we do for fun & relaxation. Is that the same for you? J: I love to garden. I also enjoy cooking for my little family (my husband and 11-year-old daughter). I do bead at home quite a lot, though, mainly because the beading I do at work is obviously work-related and if I want to create for personal reasons, then I have to do it at home. T: What piece of beaded jewelry do you now own that you absolutely could not live without? 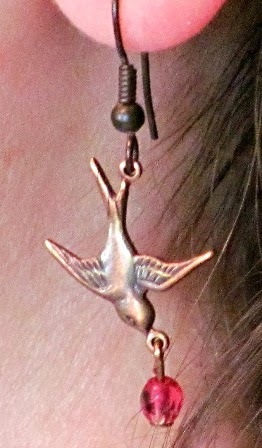 J: I made a really cute – and super easy – pair of earrings with some findings that I got in a Bead Hoard Curiosities box (from A Grain of Sand). 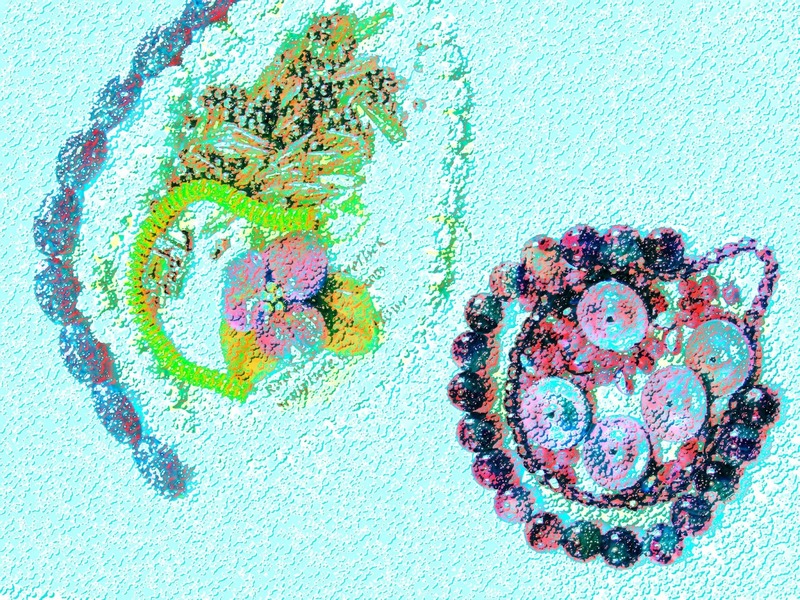 I've attached a photo of one of them as well as a picture of the findings I used. I love those earrings and I really want to visit Milwaukee specifically to meet Julia in person. I'll wait until the blizzards are done though. Too cold for this Southern girl. So, I received a beautiful focal consisting of lampwork leaves and flower by Barbara Svetlick; (oh my goodness, the yumminess! 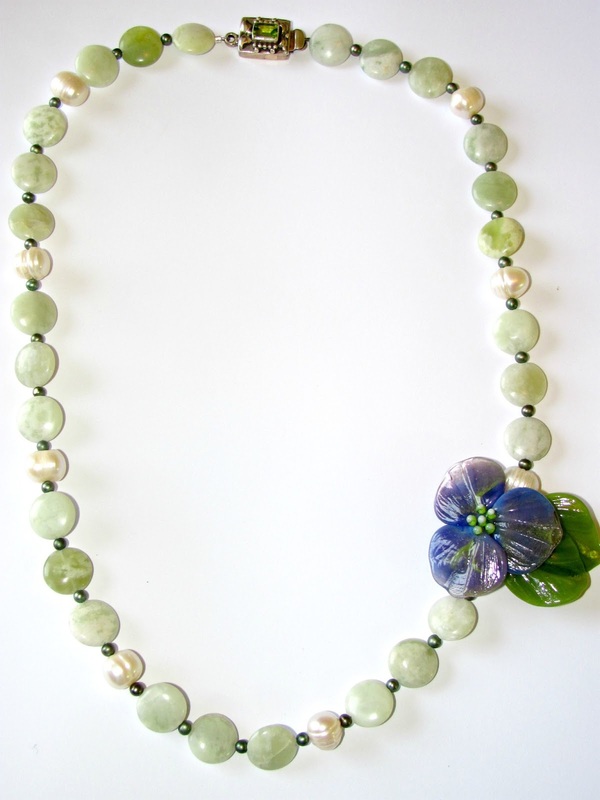 ), a sterling box clasp with a peridot, the cutest 3mm green pearls, olivine green dagger beads, some 13x20mm Czech glass goodies in a gorgeous orchid, white 10mm pearls (to die for), 10mm teal and purple died agate, 6mm two-hole lentils in lime (slurp! 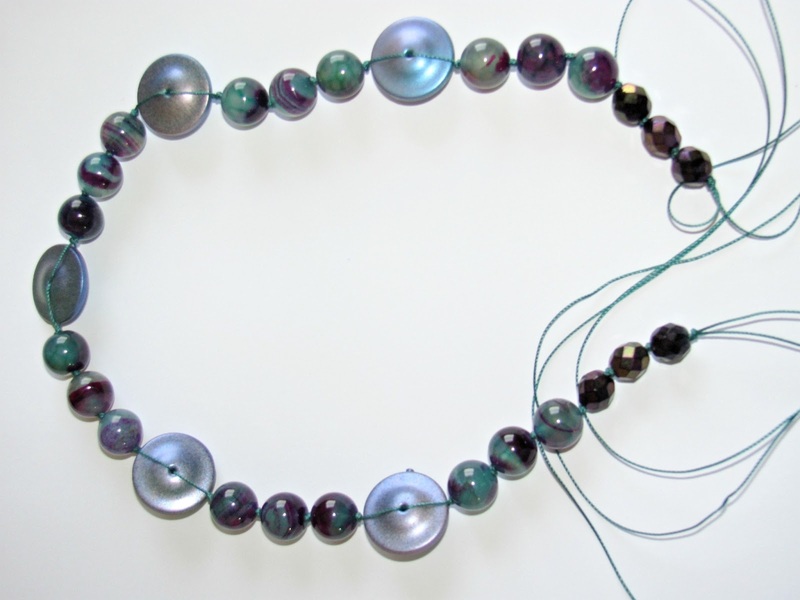 ), 4mm purple fire polished beads, 5x18mm disks in a purple/green/teal (swoon! ), 5x7mm curved petals in purple AB and 4x6mm opaque lavender drops. Breathe! It's like she read my mind and discovered my favorite colors. I used the pearls (both the tiny green ones and the large white ones) and mixed them with some "pearl jade" that I picked up from the store. I really wanted to showcase the flower, and the creamy pale green mixed with those pearls really seemed to do the trick, plus I wanted that focal to be off center. It's a bit dressy but I love it. That means I am keeping this baby for myself. The photo does not do it justice - it was really difficult to capture the colors. I may get my friend Jessi to take some better photos. I had some vintage faceted Bohemian glass in a purple irid but I'm not yet sure if they work. They may be too formal looking to work with the rest of the piece. I'll look at it for a while before I decide. I need to find something to give me four inches on each side of the piece. I might get some lampwork rounds from Pam to finish this. We'll see. As for the rest of the stash, I've already got plans for them. Those two-hole lentils will be a challenge but I'm sure I'll figure it out. I'm considering a macramé piece to work everything into. And those large orchid beads will become the base of another necklace. And in other news I have some new classes coming up at Nomadic Notions. There will be plenty of eye candy in the next few weeks. I'm baa-aack! I received my beads from my partner, Julia Gerlach. Next week I'll give you nice clear pictures of what we sent each other. I like to keep things under wraps almost up until time for the big reveal. Let me say once again - it's like she read my mind. She sent my favorite color palette, so y'all know there is a bit of olivene green with some violet in there somewhere. And yes, I went missing in action again. I won't bore you with the ongoing details BUT if your pharmacy gives you pills that are dyed in wonderful colors, think twice before ingesting as those dyes can have adverse effects. It will get better. At this point I'm trying to figure out how to put them into jewelry. I am positive there is a way. Hey - March 17, 1:00 - 4:00 - The Bangles in their return engagement at Nomadic Notions! Two new items were added to the Etsy store. It's not much, but it's a start. And there is more of that on the near horizon along with more beading and more writing. Aren't they lovely? I thought so. Now you must stay tuned for the reveal so that you can see what she actually received and what she did with them. You also get to see what she sent me and what I did with them. In the meantime, I have some other things to do, including finishing a couple of class samples. Happy beading! I have a new partner, well at least for the Bead Soup Blog Party. She is none other than Julia Gerlach, editor for Bead and Button magazine. I'll post a sneak peek at what she's going to receive tomorrow. In the meantime, here is a photo of this weekend's class at Nomadic Notions. It's called "I Want to Bead Alone". Yeah, I said that. It works up so fast! It's almost instant gratification. You could possibly leave with a new necklace! Saturday, February 9, 1:00 - 5:00. Don't You Think You Deserve Flowers? I'll add tidbits as allowed following up, of course, with the blog hop links. I enjoyed this so much the last time I did it that I just could not pass up the opportunity to do so again. And, even though you can't join this time around, you CAN join the Bead Soup Cafe on Facebook. Guess who got a kidney for his third birthday? Needless to say it was not only a great birthday but an exceedingly special Christmas. Not so much an update as it is a promise - I won't leave you to your own devices for this long again! Obviously you all need supervision. Several doors of opportunity stand open before me right now and I just need to take that first step, the one that leads to the entrance of each of them. The wonderful thing is that each door entails creativity. I don't know about you but my creative self lacks time management in a big way. So today I found a couple of time management tools to help me with that (and I need quite a bit of help). I am hoping you will look through the windows as I step through the doors and maybe even find a little inspiration of your own.